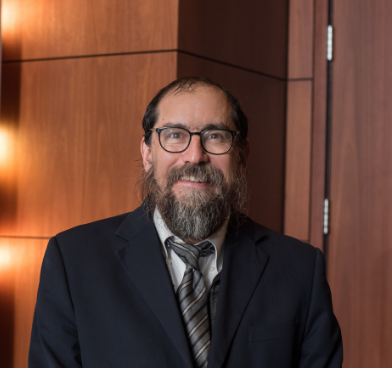 Rabbi Hillel Baron is the Federation's Community Chaplain, offering religious services and pastoral counseling for Jewish residents in facilities throughout Howard County and at home. In addition, he ministers to Jewish patients at Howard County General Hospital. How would you describe your role at the Federation? As Community Chaplain, I visit hospitals, senior living facilities, and nursing care facilities, as well as conduct home visits by request. The people I visit and serve may be seniors, those who suffer from chronic illness, or someone who just needs a caring presence. More importantly, I help family members and caregivers, who, in taking care of their loved ones, may not be getting sufficient attention themselves. In my role I ensure that anyone who wants spiritual support will receive it. In the absence of a Jewish chaplain, Jewish patients would be assigned a chaplain from another faith, someone who may not understand all the religious needs of a Jewish patient. One of the most important parts of my role is serving as an objective, non-judgmental party. Sometimes aging individuals have a hard time accepting their growing limitations. And sometimes it takes an outside person to help the person accept their situation or come to terms with their next life decision. Many children of aging parents struggle taking care of those who once took care of them. Children may feel they’re making decisions in their parents’ best interests, but the parents may feel that the child is telling them what to do and threatening their independence. Let’s say somebody complains to their daughter that they are afraid of falling. The daughter may want to take action—either get a helper in the house or move her parent to a nursing home. But if the parent shares the fear with me, I’m not one to take action or tell them what to do. Instead, I help them process the situation, reflect on it, and maybe in the process realize what action is called for. Sometimes people want to call upon their faith system, whether that is their faith in God or even, at the minimum, their faith in themselves and their abilities to overcome challenges. As an outside party, I can help them through that process. Even those who are synagogue members sometimes find it easier to share their struggles with an independent rabbi. Although I visit Howard County General Hospital, assisted living facilities, and nursing homes several times a week, there is no typical day because at any time I can get a call requesting my services from the pastoral care division at the hospital or from a community member. Sometimes a Jewish patient at the hospital requests a visit and sometimes a community member or patient experiences a sudden decline and the family needs help coping with the sudden change in prognosis. Some of the locations I visit include Harmony Hall, Owen Brown Place, and multiple locations under Lorien Nursing Facilities (in West Columbia, Jessup, and Marriotsville). Once a month I also bring seniors to the Kugel Connection luncheon at the Lubavitch Center. What are some requests you get at the hospital and living facilities? I’ve had requests for (electric) Shabbat candles at the hospital. I’ve had requests for a menorah. I’ve had requests for prayer books or something meaningful people can read, whether a chumash (Pentateuch) or something about Jewish customs. Sometimes people cannot afford to have a traditional Jewish burial. I talk with providers to see that they can provide a traditional Jewish burial at the budget that the people can afford. What is the most meaningful part of your work? I was once with a couple when they lost their child to a genetic heart disease. I remember talking to the father, trying to convey hope and comfort to him. Years later I attended a shiva where this same man was sharing my words with someone else who was facing a time of sorrow. By drawing on our traditional resources and faith, we can give people the power not just to overcome their own personal situation but to help others in need. It was much more powerful to hear this man, who himself had gone through a challenge, give strength to someone else. What Jewish value is most important to you in your work? It ultimately boils down to faith in God, emunah. Faith helps us cope with all challenges. Faith means believing not just that God created the world or took us out of Egypt a long time ago, but that in the here and now, God can take us out of our misery, our challenge, or otherwise burdensome situation. It doesn’t mean that God will give you what you want. But God will give you whatever you need to make the best of your situation. And that goes hand in hand with prayer: Why do we pray? We don’t pray to let God knows what we are going through—He knows. We pray to know that God can help us and does help us in our situation. I think it was simply the satisfaction that I had in assisting my own rabbi, Rabbi Kaplan, in his community work in Baltimore. He recruited me, so to speak, when I was a teenager. I caught the bug—the love of being able to be there for people and the feedback of personal interactions with people. What do you wish for the future of the Federation’s chaplaincy program? There’s an infinite number of needs that we can fulfill as people retire or age in place. I would love to have more community programs to keep seniors across the spectrum of independence engaged and connected. You can reach Rabbi Baron at rabbihbaron@gmail.com.